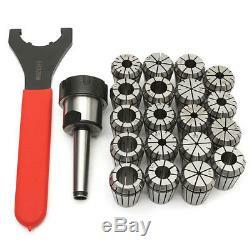 MT2 ER32 Collet Chuck M10 Milling Tool Holder with 19Pcs ER32 Spring Collets Set. Description: MT2 ER32 Collet Chuck M10 Milling Tool Holder with 19Pcs ER32 Spring Collets Set Specification: Mt2 M10 ER32 Collet Chucks Model: MT2 ER32 M10 Material: Metal Size: 121cm spindle Drawbar thread: 7/16 ER32 clamping range: 1-20 mmner: 250 mm Suitable For: MT2 ER32 M10 dedicated machine ER32 Spring Collet Set Material: high grade spring steel Color: Steel Color Type: ER32 Length: 39mm diameter: 32mm Inner diameter: 2 mm-20 mm Quantity: 19Pcs Features: -Available in the BT ER extension rod handle, can be used for clamping drill, milling cutter, straight shank tool. Collet must be assembled into the clamping nut before inserting into the chuck. Ease of operation and high quality work results. Before using this tool, please measurement tool deflection, tool deflection accuracy exceeds 0.01 MM, Please correct before cutting. The tool extends the length of the chuck as short as possible, the tool extends the amount of time longer If extended, please cut their own speed, feed rate or cutting the amount. If the cutting of abnormal vibration or sound, cut spindle speed and depth of cut to improve the situation so far. Package included: 1 x M10 ER32 Collet Chuck MT2 1 x Tensioner 19 x ER32 Spring Collet Set 1 x Storage box More details. The value of the goods specified can not be less than the value actually paid and the object can not be marked as "gift" Because the practice is not permitted by the Authorities. Listing created with DropSheep Professional. The item "MT2 ER32 M10 Collet Chuck Milling Tool Holder with 19Pcs ER32 Spring Collets Set" is in sale since Thursday, August 23, 2018. This item is in the category "Home & Garden\Other Home & Garden".elettronica" and is located in China. This item can be shipped worldwide.